When having naturally grown turf will cost way more than your budget can afford, the best solution is to have artificial turf installed. Be it to have a patch of green for your lawn or a nice putting green in your landscape, such low-cost alternative to real grass can be your last resort. And when it comes to sourcing and installing first-class synthetic turf for commercial and residential properties in East Bay area and San Joaquin Valley, you can always rely on Design West Landscaping. Low-maintenance – Synthetic turf is considerably easier to maintain than naturally grown grass. There is no need for watering, mowing, or fertilization. You'll also get years of service from this type of turf because of its hardwearing nature. Safe for kids and pets – This type of grass doesn't need pesticide and is, therefore, safe for both kids and pets to play at. It is also softer and provides enough cushion for slip and fall accidents. Perfect for high traffic areas – Given the sturdy quality of artificial grass, it is highly ideal for use in high traffic areas, like playgrounds, sports fields, and residential lawns. Best for outdoor activities – Whether intended for sports events or for recreational activities, artificial turf allows for worry-free holding of physical activities. This grass type is durable and highly recommended for areas where there are activities happening every now and then. 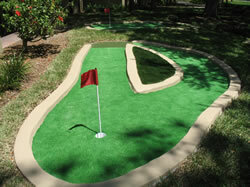 Design West Landscaping can also install putting greens inside your property. In fact, we have provided a lot of these recreational amenities to numerous clients in the areas we serve. Our lengthy experience in installing these products makes us the best company to hire if you want your very own putting green to practice your golf swings on. The beauty of using artificial turf as putting greens is that it is hardwearing and looks like real turf. In fact, you need to take a second and closer look to know that you're actually standing on a synthetic putting green and not on a real one! And add the fact that synthetic turf only requires half as much maintenance efforts as natural grass, and you're in for some huge savings. Our company has been known for our expert artificial turf installation. We have personnel with extensive experience and deep knowledge of the proper way of installing these products. They also follow a systematic and fail-proof process each time, so clients like you need not worry about having to order us a back job. We also use only premium synthetic turf products that are guaranteed UV resistant, sturdy, appealing, natural looking and able to provide the benefits that you expect. So call us today at (209) 327-9661 for a free estimate. We look forward to visiting your property so we can offer our best price quote.